Arkansas native Denele Campbell tracks her family’s roots in the state back to the early 1800s and credits this inheritance for her love of homegrown tomatoes and hoot owls late at night. After college and a few years on the West Coast, Campbell and her then-husband settled on a tick-infested Ozark hilltop to raise three children amid organic gardening, milking goats, and preparing for the apocalypse. Since the 1980s when her series of biographical profiles of musicians was published in The Grapevine, Campbell’s interest in Northwest Arkansas and its people has resulted in articles published in the Washington County Historical Society’s quarterly, Flashback, and several books. The Violent End of the Gilliland Boys is Campbell’s most recent work focusing on local history. Murder in The County by Denele Campbell is a collection of 50 True Stories of the Old West. Some people think that Arkansas was nothing to do with the Old West, but it was firmly up there with places like Texas. And crime abounded, from the theft of horses to livestock rustling, bootlegging and murder. Washington County saw more than its fair share of crime, in particular fatally violent crimes. And this wasn’t all on the boundary with Indian Nations; many of these murders took place within the homesteads that dotted the county. This is a collection of 50 of those murders, researched through years of history, legal records and accounts in the newspapers, a collection that will make your blood run cold. 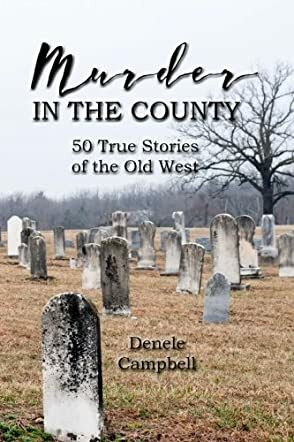 Murder in The County: 50 True Stories of the Old West by Denele Campbell is an eye-opener. There is real variety here and some of the tales make you wonder why the perpetrators were never caught or tried for the crimes they committed. It’s a really well-written book, with accounts that have clearly been researched as deeply as possible. It made a nice change to read a true crime book that is filled with older stories; most these days focus on current criminals and it's nice to see how different or not things were in earlier days – the nature of the crimes certainly hasn’t changed much through the years! I really enjoyed this book. The stories were brought to life through the descriptive nature of the book and it was written in a way that made you want to keep reading from cover to cover, and not skip through by reading a chapter here or there. Highly recommended for fans of true crime and of the Old Wild West.